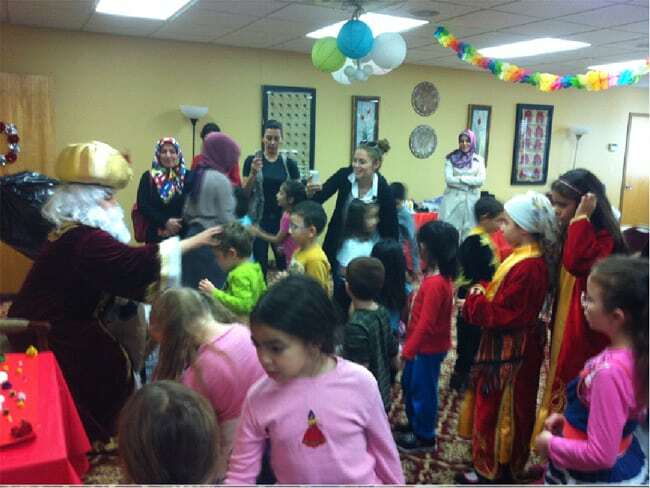 Our students celebrated feast of sacrifice with Nasreddin Hodja who is a Turkish satirical figure, remembered for his funny stories and anecdotes. They learned from Nasreddin Hodja what is done in the feasts such as helping to poor people, kissing hands of elders while they are having fun. They had an unforgettable feast!! Nasreddin Hoca was born in 1208 in Hortu village near town Sivrihisar (near Afyon) in the west part of Central Anatolia. He moved in 1237 to Aksehir town to study under notably scholars of the time as Seyid Mahmud Hayrani and Seyid Haci Ibrahim. He served as Kadi, Muslim judge, from time to time till 1284, which is the date of his death. Nasreddin Hoca was a philosopher, wise, witty man with a good sense of humor. His stories have been told almost everywhere in the world, spread among the tribes of Turkic World and into Persian, Arabian, African and along the Silk Roadto China and India cultures, later also to Europe. Of course, all these stories currently attributed to the Hoca for about 700 years haven’t originated from him. Most of them are the product of collective Humor of not only Turks but also other folks in the World. Nasreddin Hodja, or Hoca which means teacher in Turkish (“c” is pronounced in Turkish like “dj” or like “J” in “John” in English), is known as with different names in the world. Some examples; Turks say “Nasreddin Hoca;” Kazakhs, “Koja Nasreddin;” Greeks, “Hoja Nasreddin;” Azerbaijanis and Iranians, “Molla or Mulla Nasreddin;” Arabs, “Juha;” and Tajiks, “Mushfiqi”. And some spellings of Nasreddin: Nasrudin, Nasr ed-din and Nasr al-din. The year 1996 was proclaimed “Nasreddin Hoca year” by UNESCO. He is, now in 2004, 796 years old. He signed the humor of the millennium at the top.